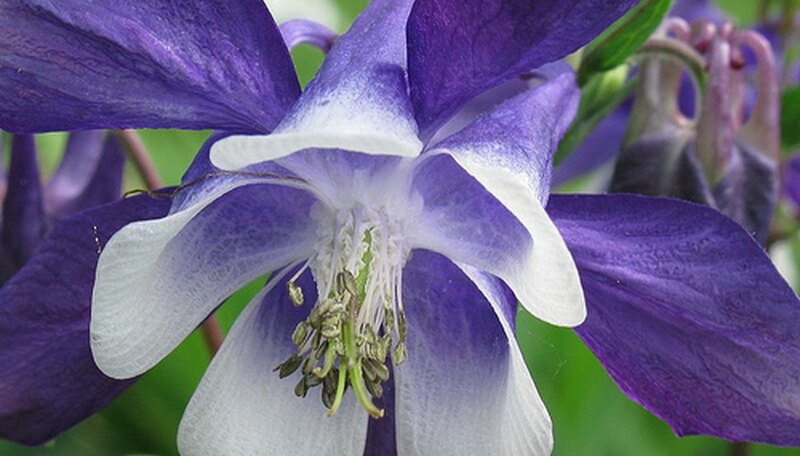 Granny's Bonnet is another name for the perennial wildflower columbine, or Aquilegias. Hardy in Zones 3 through 9, Granny's Bonnet has delicate foliage and 1- to 3-inch blooms in an array of colors. It's easy to grow Granny's Bonnet; the plant will adapt itself to a variety of conditions in your garden or landscape. The plant can grow up to 3 feet high, with flower blossoms beginning mid-May and lasting through June, if you remove the faded blossoms. Select a partially shaded area of your property to plant Granny's Bonnet. The plant will grow in full sun if you keep it watered daily. Make sure the soil drains well wherever you plant Granny's Bonnet. Plant the wildflower in the spring or late summer, 2 feet apart, with the crown at ground level. The crown is where the roots meet the plant stems. Cover around the plant with hay or bark mulch to aid in moisture retention. Feed your Granny's Bonnet monthly with water-soluble, all-purpose fertilizer. Make sure to keep the plants watered during the growing season. Remove any faded flowers promptly to extend the lifespan of your Granny's Bonnet. The plants self-seed and cross-pollinate easily, but doing so will decrease their productivity. The average productive span of columbine is three to four years. After this time they lose their vigor, and you should replace the plants with new ones. Increase the thickness of the mulch to 3 inches over the plant during the fall and winter seasons for added protection. Start your Granny's Bonnet seeds indoors in pots or flats. Spread the seeds on top of the soil. Refrigerate the flats for one to three weeks. Remove them and place the flats in a room with good sunlight, moist soil and temperatures that range from 70 to 75 degrees so they will germinate. Sow Granny's Bonnet seed directly in the garden from early spring up until the middle of the summer. The seeds will germinate faster with light, so leave them uncovered. Water lightly. Katherine Kally is a freelance writer specializing in eco-friendly home-improvement projects, practical craft ideas and cost-effective decorating solutions. Kally's work has been featured on sites across the Web. She holds a Bachelor of Science in psychology from the University of South Carolina and is a member of the Society of Professional Journalists.